For use when T-Slots are not available. Cost effective alternative to expensive T-Slot machining. Excellent for use where hydraulic system are not available or not desirable. Precision ground chrome bearings for effortless die movement in any direction. Easy to retrofit to bolsters, with only simple drilling tools required. 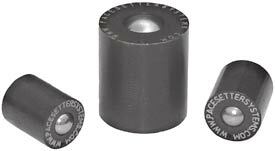 Available in four sizes to meet any die moving application. Easy installation and removal, without special tools.